Now, Nichols is among several students who are working with Jonathan Micancin and James Bray, both Blackburn biology professors, as well as beekeeper Arvin Pierce on the campus’s nine hives and eight more on a Palmyra field site. Blackburn has even started packaging limited amounts of honey upon gathering roughly 100 pounds’ worth from several incomplete harvests. These hives have also kick-started conversations on sustainability as well as ecological questions in and out of the classroom. According to Bray, Blackburn had a so-called “bee tree” on campus for years, complete with its own warning sign. 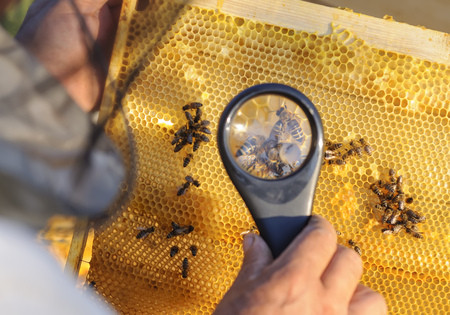 However, in 2016, college administrators alerted staff that despite searching for other solutions and advice from beekeepers, they had to eradicate the hive, as it had been deemed a liability. “It was an alarming email to get,” Micancin said, leading to his contact with Pierce. Pierce would then set up exclusion traps, steering the tree bees into a bee hive box nearby. More hives followed from there, and this eventually led to a Bayer grant for establishing a campus pollinator garden. According to Micancin, “This garden is off to an amazing start. Students kept these plants alive all summer. They were spreading mulch and watering and doing what they could to keep it going.” This garden generated butterfly and bee activity all summer, per Micancin. Because bees can cover nearly two miles for pollen collection, he suspects bees from all over campus likely fed the garden. Per Micancin, “The early goal for the bee project was to give students an opportunity to work and learn an important skill that’s closely related to the biology curriculum, that supports sustainability, and for it to be marketable after graduation.” Bray also stated of the project that they started because “it was the right thing to do.” Nichols added that the interaction bees have within nature through pollination is something most people underappreciate. “Economically, it’s beneficial. Look at places with lost pollen populations…People are having to pollinate by hand with feather dusters. They’re doing the work of bees.” Hopefully, more open-minded endeavors like this arise to the point of it becoming the norm in the future.